Fabric markers are available in a variety of tips and ink thickness. 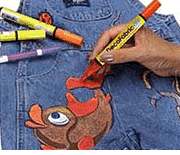 If you’re writing on a darker material you’ll want a fabric paint pen. 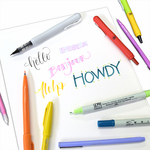 If you’re writing on a thin material you’ll want an ink fabric marker. Below you will find a wide range of fabric markers. Use the filter check boxes on the left to find the perfect match for your project!